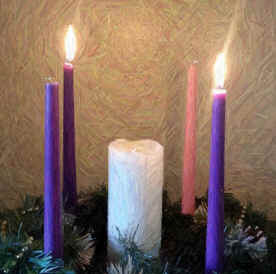 The season of Advent begins on the fourth Sunday before Christmas day. The term Advent, means coming. The Advent season helps us prepare our hearts to remember the first coming of our Savior and the reason he came: his birth was for his death; his death was for our birth. Advent also reminds us that Jesus is coming again. On that day he will separate the sheep from the goats, that is the believers from the unbelievers. 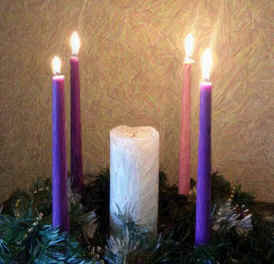 Making an Advent wreath is a great way to prepare the family for Jesus' birthday celebration! One flat Styrofoam disk per wreath, enough green silk pine picks to cover the top of the Styrofoam, gold metallic ribbon-enough to cover outer edge of Styrofoam, glue, 3 purple candles, 1 pink candle, 1 white candle. Glue the ribbon to the outer edge of the disk. Push the white candle into the center of the disk. Push the other candles evenly around the white candle, towards the outer edges of the disk, as shown in the picture. (You might want to place a bit of glue into the candle holes for added stability.) Push the pine picks into the disk, around the base of the candles to cover the top of the Styrofoam. Optional decorations: Drape a strand of faux pearls on top, add to that small, white-tipped pine cones. This makes for an elegant coffee table display during the Christmas season. My children and I made our Advent Wreath many years ago during our church's Kingdom Kid's program; we've used it every year since! The lighting of the Advent wreath holds fond memories for our family. Your donation to the site helps to bring our children's ministry resources to churches across the world. 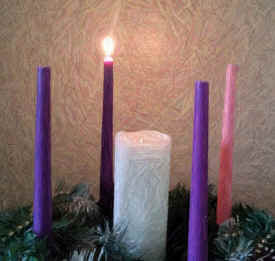 Set aside a few minutes each day during Advent to light the candle(s) and worship. This will help everyone in your family to get ready for the coming of Jesus' birthday celebration! 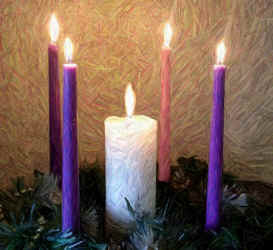 On the fourth Sunday before Christmas Day burn the first candle, read the Scripture references, sing a carol and pray. On the next Sunday you will burn the first and second candle. Continue in this manner until the Sunday before Christmas when you will burn all four candles. On Christmas Day you burn the "Christ Candle," signifying that Jesus has come! 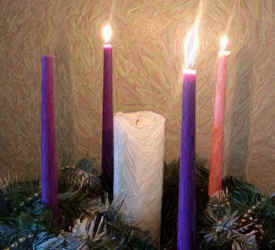 See our No-Flame Advent Wreath and Chrismon Wreath.